As Bryan Hall walked up to a group of general conference protesters one cold October morning, he never thought that he would one day become friends with the ringleader, Ruben Israel, a man he had come to hate—a man he had never even met. 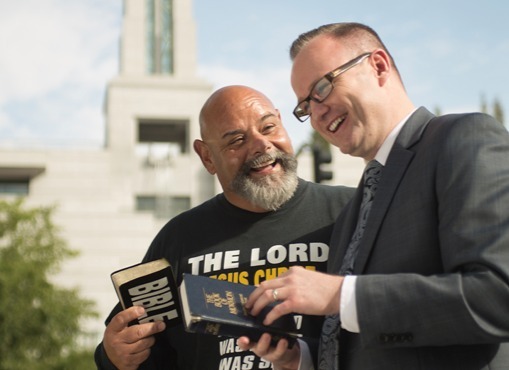 For years, this Utah born-and-bred devout Mormon had seen Israel and those like him yelling at members just outside some of the most uplifting Church events: general conference, the Manti Pageant, and the Hill Cumorah Pageant, just to name a few. He thought their antics cruel, irreverent, and ignorant. He simply could not see any good in these people. But in Ruben Israel, he found his nemesis. “I found myself watching all sorts of YouTube videos, documenting a number of these ‘anti-Mormons’ who were allegedly persecuting us during sessions of general conference,” says Hall. “I found myself furiously focusing on one particular protester: Ruben Israel. Hall hated what he saw. 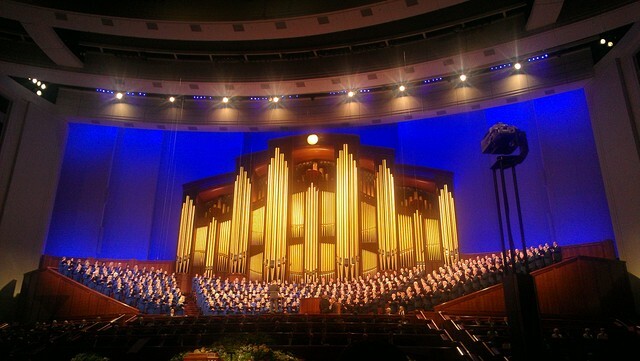 He reasoned that many Mormons must also have the same negative feelings toward these people. 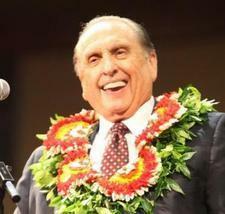 He hated how disrespectful they were toward things that he and Mormons everywhere hold sacred. But for some reason, Hall channeled all his anger towards the man who appeared to be their leader: Ruben Israel. “As I dwelt on this,” he says, “the anger inside me swelled to an almost unbearable level. It’s sad to relate just how deep this anger grew within me.” But Hall thought that confronting Israel about his antics would only make things worse. He tried to push the problem away, tried to ignore it. But it was no use. But ignoring it was exactly what Hall thought he was supposed to do. He had seen many angry scenes of Mormons and protesters yelling, and it always went south very fast. As a young boy, Hall had grown up going to the Manti Pageant with his family in the summertime. It was there that he first recognized the anger that accompanied the “discussions” that many Mormons had with the protesters. It was there that he learned perhaps ignoring it was best. “I was just a kid observing this from a distance, as a few members of my family tried to reason with these men. I never listened to what either side was saying. I just felt the argument. I remember feeling that something was very wrong there. But as I look back now, I realize that the negative experience was coming from the fact that everyone was breaking the commandment where Jesus says that there should be no disputations among you.” He realized that it wasn’t what they were saying that mattered—it was how they were treating each other. Suddenly, Hall remembered another young boy who also was confused by the hatred and bickering surrounding him: 14-year-old Joseph Smith. The more Hall studied the accounts of the First Vision, the more he felt some of Joseph’s confusion was over the arguing itself. After that, Hall knew that he couldn’t sweep the hatred and confusion under the rug anymore. “I wasn’t at peace with what I interpreted to be the appropriate way to handle the situation. And so I did feel that it was spiritually my responsibility to get over this.” After a while, the anger and the inability to ignore it became too much for him. At the suggestion of a friend, Hall decided to finally talk to Ruben Israel. So just before the Saturday morning session of the October 2007 general conference, Hall approached Israel on the street. He may have been resolved to talk to him, but he was not quite prepared for what he saw—or for what happened next.